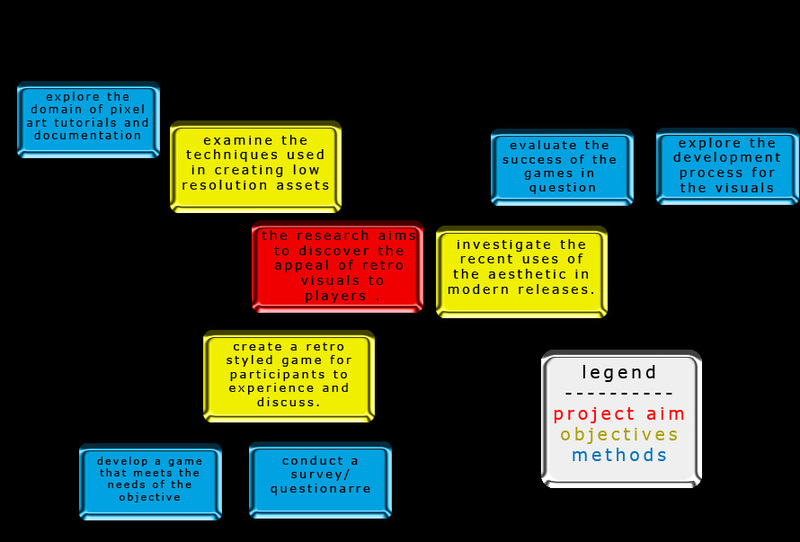 for *tomorrow* i`ve got to develop a project aim, break it down into core objectives and make a personal statement. quite a tall order,i`ll start with the easy stuff. personal statement. for my show case i`d the final piece to be an interactive game for people to enjoy and reflect on what retro games are to them. typically anything involving 2D artwork. sprite work is a big passion of mine, but i`m confortable with other elements of 2D visuals such as character animation, environment design, cut scenes and user interface design. traditional art obviously, i use at the fundamentals for mostly everything i create. i`m extremely proficient in photoshop and quite adept in flash. I have a fair grasp of 3D software like maya and max. i use a lot of video software, most recently sony vegas. obviously i`d like to develop a finer understanding of low resolution artwork, but generally strengthen my 2D skills in all areas. game creation typically involves using all the aforementioned skills. Pretty waffletastic but I assume i`ll be coming back to revise it in the future for my final project pitch. the research aims to discover the appeal of retro visuals to players and spectators. okay,i hope some of that makes sense, now as you can see below I made an illustration to show the objectives and methods. and last but not least, a little preview of the pixel work. animated.compressed as usual, imagine there’s text at the bottom and a level in the background.